Ski goggles are an especially valuable accessory to have if you are a lover of winter sports. Whether you’re going skiing, snowboarding, or you’re just enjoying the winter break with your friends, you will need a pair of these. They have multiple purposes and will not only protect your eyes from the snow and the wind, but they will also make you look better when you’re performing various outdoor activities. In this article, you will find out about the different features of the OutdoorMaster OTG Ski Goggles. Let us look into what it has to offer for you to determine if these modern ski glasses would be the right product for you. OutdoorMaster is a company dedicated to making everyone have an enjoyable experience outdoors. They create various equipment and clothing for outdoor sports and similar fun activities. Compared to the popularity of their brand, their products are highly affordable, which is a big bonus for all those who can’t make extra space in their budget, but love enjoying nature. This product is best suited for adults and teenagers. Young children won’t be able to utilize it properly, as it’s designed to fit an adult’s head size. We would also like to note that, as compared to many competitor products, this pair of glasses is highly affordable yet they have all the required features and high-quality design. This makes them the perfect option for all those who are looking for a good budget choice. When purchasing this product, you will also receive a bonus item, which is the OutdoorMaster carrying pouch. It will make it convenient for you to carry your glasses around at all times. It will also ensure that you don’t accidentally drop them or smudge them while outdoors. Additionally, you will receive a one-year warranty and would have access to friendly customer support that will help you answer all your questions about this product. The unique design of the OutdoorMaster OTG Ski Goggles will allow it to fit both adults and teenagers, but the smallest of children won’t be able to wear it. 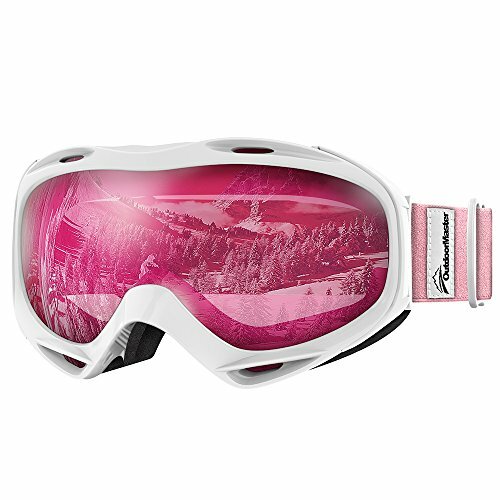 Nonetheless, the OutdoorMaster OTG Ski Goggles has specifically designed dual lenses that will prevent any fogginess. You won’t be required to clear them frequently, and there is no danger of your vision being obstructed during skiing or snowboarding. Likewise, the high-quality dual lenses are equipped with TPU frames that help protect your eyes from ultraviolet light. These frames are also invisible and durable. For this reason, they will last you for years without getting worn out from the sun. If you are planning on using ski goggles with a helmet for protection, you might be wondering whether this specific pair of glasses will be compatible with the head protection gear that you already have. Don’t worry, as the elastic strap is really long and it can fit all helmets currently on the market. That said, we recommend that you always use a piece of headgear when participating in winter sports, as safety should be your number one concern. On another note, different color patterns and looks are available for this model. Beware though of the fact that some are more expensive than the others, solely based on looks. It’s pretty clear how to use the OutdoorMaster OTG Ski Goggles, but there is a safety concern that needs to be addressed. You should make sure your goggles are neither too tight nor too loose when wearing them. Making the strap too snug might seem like a good idea, but this will eventually lower the amount of blood that gets to your head, and you might get confused during an activity. Young teenagers can enjoy this pair of ski goggles, but you might be looking for an option that is more suitable for children age four to nine. In that case, we recommend COPOZZ G3 Kids Ski Goggles. These goggles are just a few dollars more expensive than the first pair we talked about, and they have the same features. The only difference is the fact that the size makes them more fitting for young children. On the other hand, a more expensive option might suit you better if you’re serious about getting into professional winter sports. In that case, we recommend the OutdoorMaster Ski Goggles PRO. These goggles were manufactured by the same company, and feature a frameless design that professional winter athletes would love. As far as winter headgear goes, having a suitable helmet and a pair of goggles is almost as essential as wearing a jacket. We have examined a pair of ski glasses that are high-quality and have no significant downsides. However, if you’re looking for a model more suitable for kids or professional skiing, you can check out the alternatives we talked about.